Goals for improved student learning and achievement are widely shared among school districts in Canada. Within these goals, the idea of transforming learning environments for adolescent learners to address persistent gaps in student achievement and student disengagement in and from school is taking hold. At the same time, concerns about the ability of current models of schooling to equip all young people for success in contemporary society are also growing. As school systems work at issues inherent in a model of schooling designed for the past, the 21st century learning agenda also challenges them to advance new processes and outcomes for learning. The qualities and outcomes advanced as the hallmarks of 21st century learning have been part of the fabric of conversations about public education for decades. In the context of economic, social, political, and cultural changes inherent in the transition from an industrial to post-industrial world, educators have been called upon to consider ideas about teaching and learning that once tended to exist on the margins as central to their practices in classrooms and schools. In the context of the transition from an industrial to post-industrial world, educators have been called upon to consider ideas about teaching and learning that once tended to exist on the margins. Increased calls for secondary school redesign may signal a readiness for considering how schooling might be (radically) different. The Cisco-Intel-Microsoft Working Group on Classroom Environments and Formative Evaluation, chaired by Marlene Scardamalia, argues, “… anything that deserves the name of education for the 21st century needs new kinds of objectives, not simply higher standards for existing ones.” These calls, in turn, inspire compelling questions about secondary schools for the future: What objectives will anchor an education for 21st century learning? Can newer ideas about what all students need to know and be able to do become a starting point for rethinking what students learn, how learning occurs, and who the learning is for? Can education systems create learning environments that engage all students in the kind and quality of learning that was once reserved for only the few? The challenges faced by young people as they navigate their day-to-day lives in secondary schools have been central to the Canadian Education Association’s (CEA) Agenda for Youth since 2005. Beginning with Imagine a School and Design for Learning, students have played a significant role in shaping our perspectives on prevailing ideas about youth and their learning. Their narratives provided the impetus for the development of What did you do in school today? – a three-year research and development initiative designed to capture, assess, and mobilize new ideas for enhancing the learning experiences of students in classrooms and schools. Since 2007, What did you do in school today? has grown from a network of ten to seventeen Canadian school districts. 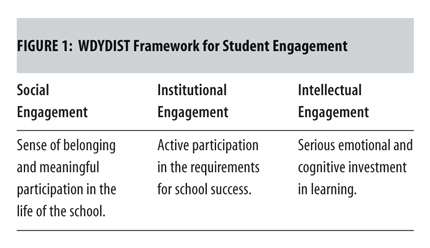 Administrators, teachers, and students in more than 150 schools are now working with a multidimensional framework for understanding student engagement that builds on the established concepts of social and academic (or institutional) engagement and advances the newer concept of intellectual engagement (see Figure 1). A set of measures that capture all three dimensions provides a foundation for understanding what students are doing in classrooms, how they feel about their learning experiences, and how the work they do contributes to learning. A new measure – instructional challenge – developed from Csikszentmilhalyi’s theory of flow, offers further insights into students’ experiences of learning by tapping into the balance between the challenge inherent in the work they are asked to do in classrooms and their skills to do that work (see Figure 2). Across Canada less than half (between 42 and 47 percent) of middle and secondary students experience flow in their math and language arts classes. The remaining students find their schoolwork either too difficult or too easy, while a small percentage (less than 8 percent) felt apathetic toward their learning (“I can’t do it and I don’t care.”). 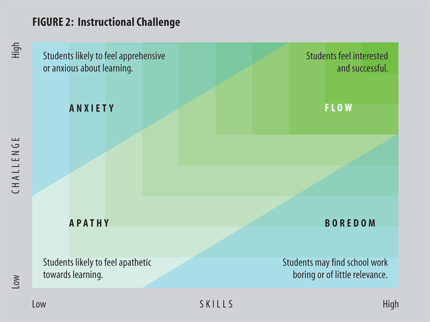 The odds of students in the top left quadrant (low skills/high challenge) being intellectually engaged in learning are only 27 percent, with these odds falling even lower for students in the bottom left quadrant (low skills/low challenge). These ideas about intellectual engagement and instructional challenge that blend theory with insights about teaching practices and learning experiences, have resonated strongly with many educators and students because they reflect the kinds of learning they both aspire to. Grounded in reliable data, the core concepts of What did you do in school today? have also become an important source of new local, regional, and national conversations about teaching and learning, the most expansive of which are seeking to understand what is required to achieve higher levels of intellectual engagement across grades, curriculum domains, and the range of abilities and aspirations students bring to their learning in the 21st century. In acknowledging schools as important places for young people to gain an expanded set of competencies, the 21st century learning agenda creates room for understanding learning as a resource for “a successful life.” Many educators will find this idea evocative because it reflects the beliefs about the purposes of schooling that they bring to their work. For school systems, however, the idea presents two significant challenges: not only does it suggest new objectives for learning – from the accumulation of discrete skills and facts to deeper levels of understanding required for the development of 21st century competencies – but it does so for all students, in all classrooms, and in all schools. The journey towards a fully equitable public education system has been long and remains unfinished. Even with new evidence, a belief that all students can transition to adult roles (e.g. civic and cultural participation, earning a living, caring for self and family) with confidence and competence can feel like an uneasy fit with traditional beliefs about students: that some are “academically inclined” and others are not; that those who are apparently not “academically inclined” are best served in vocational or “applied” streams; and, that the competencies required for learning and thriving in the 21st century can be sorted according to pathways that students choose, or are encouraged and sometimes required to follow. Students differ in their aspirations, interests, and aptitudes. But it is worth considering how distinct pathways, trajectories, or streams that too often limit opportunities for students could become permeable spaces for learning. What if the curriculum anchors their learning, but ceases to anchor the students themselves because its aim is the development of important competencies through diverse learning experiences that value and extend young peoples’ knowledge, interests, and capacities across all curriculum domains? Surely it is time to recognize that it is through “doing things” that students come to conceptual understanding. Perhaps the most challenging aspect of thinking about formal education grounded in the development of competencies for life is the way it calls upon school systems to contemplate new ways of learning, and therefore teaching and all that goes with it – curriculum, assessment, certification, selection, etc. Compared to mastering and measuring skills and facts, becoming a competent learner across a variety of human dimensions is complex. Competencies can be acquired, but it is not clear that they can be directly taught; they result from experiences that engage young people in thinking, doing, and feeling as pathways to “understanding the deeper things” about what they are learning. All people, no matter what their age or what they are learning, become confident and competent by thinking about and doing things with ideas, practices, and tools. Personal interests and aspirations are both a source of inspiration and an outcome of these experiences. Essential relationships contribute to the social processes of learning. When any of these elements are missing or some receive greater attention than others, learning can take place, but it may be on a superficial level or quickly forgotten. To know something deeply is to feel it through the heart, hands, and mind. The most accomplished educators, mathematicians, welders, athletes, computer technicians, chefs, community leaders, scientists, communicators, artists, mechanics will tell us that they became experts and developed a passion for their work through a deep conceptual and practical understanding of their fields. The constant interaction of “thinking” and “doing” – problem solving, experimenting, thinking critically and creatively, modelling and building, collaborating, reflecting – contributes to their learning and contributes to their field of endeavour as well as to the development of social and cultural competencies that are resources to positive ways of being and living in the world together. To harness young peoples’ hearts in learning, the work they are asked to do needs to be interesting, challenging, and designed to allow students to experience agency in their classrooms. Elsewhere, we have also argued that the nature of the relationships students experience in schools and classrooms is a significant factor in their experience of engagement. Without the help of caring adults who are able to help students navigate (and negotiate) the institutional rules of engagement in school and to discover a passion for what they are learning, young people can easily conclude that school and success are not for them. Adolescent learners want the work they are asked to do to mean something. They frequently ask for more “hands on” learning in classrooms. Today, more than ever, classrooms are hives of activity; but experience and activity are not the same things. Experiences that harness students’ hearts, hands, and minds for learning – from the shop class to the science lab – invite students into the curriculum in ways that allow them to experience it as something real, something they can “nudge about and look at from different sides, take apart, try out, become fascinated with … try to reinvent” and become passionate about. Engaging students in the curriculum in this way is the foundation for what Carl Bereiter calls “intelligent action” and what CEA has advanced as the concept of intellectual engagement. With all that is known about how students learn and the significant difference that schools can make, there ought to be a way to sort all students into learning rather than sorting some of them out. In the past it was often assumed that disengaged students were easy to identify: they were the young people at the back of the class, the ones making their way to shop or special classes, or those lingering down the street well after the bell had rung. Data from What did you do in school today? suggest that disengagement is not – and may never have been – limited to small groups of students or as visible as we once thought. Over half of the students in our sample (n=32,300) – many of whom go to class each day, complete their work on time, and can demonstrate that they are meeting expected learning outcomes – are experiencing low levels of intellectual engagement. Despite the prevalence of low levels of engagement among large numbers of students, many school systems continue to create special programs to re-engage students who are struggling to navigate institutional norms and/or achieve traditional academic programs. Such programs are “designed in ways that genuinely attempt to better meet the needs of all students,” but there is also sufficient evidence that they continue to reinforce beliefs that school success is within reach only for some students. With all that is known about how students learn and the significant difference that schools can make, there ought to be a way to sort all students into learning rather than sorting some of them out. In the context of the still emerging 21st century learning agenda, the concept of intellectual engagement provides a way into considering the kinds of learning experiences young people require to develop important competencies for learning and life. Perhaps, however, its greatest potential lies in bringing current aspirations for equity and excellence in education together through the hearts, hands, and minds of all students. Strategies focused on improving the existing structures and processes of secondary schools have proven useful in creating important but incremental improvements. If we aspire to create learning environments where all students are engaged in using and developing 21st century competencies, however, a much deeper approach may be required; one that provides for inclusive and sustained work with ideas and practices that disrupt prevailing assumptions about teaching, learning, and educational outcomes. The research is solid. Among all school factors that influence outcomes for students, teaching effectiveness makes the most difference. The idea of 21st century competencies for students is widely acknowledged, but what are the concomitant 21st century teaching competencies? What changes in educational practices do we need? What strategies at the school and district level are most likely to result in changes in classroom practices? How might we enhance instructional leadership of our schools? Will our students, teachers, and communities support new directions for teaching and learning? What is the role of the CEO in advancing ideas about teaching and learning in the 21st century? These are not matters for educators alone. Ideas about schooling run deep in the collective psyche of society. We need to engage Canadians in deliberating about what they expect from their schools today. If we expect schools to assume responsibilities for the development of health and well-being; creativity and innovation; sustainability both local and global; ethical and cultural competence; and now it seems financial literacy as well, then clearly the redesign question is large. Adding further components to a model designed to do a different set of things simply won’t do. EN BREF – Les qualités et les résultats désignés comme caractéristiques de l’apprentissage au 21e siècle font partie des débats sur l’éducation publique depuis des décennies. Depuis 2007, l’initiative Qu’as-tu fait à l’école aujourd’hui? mise sur les concepts établis d’engagement social et éducatif (ou institutionnel) et promeut le concept plus récent d’engagement intellectuel, en utilisant une série de mesures servant de fondement pour comprendre ce que font les élèves dans les classes, comment ils considèrent leurs expériences d’apprentissage et comment le travail qu’ils font contribue à leur apprentissage. Dans le contexte du programme d’apprentissage émergent du 21e siècle, le concept de l’engagement intellectuel fournit un moyen de considérer les types d’expériences d’apprentissage qu’il faut aux jeunes pour développer d’importantes compétences pour apprendre et pour vivre. Toutefois, son plus fort potentiel consiste à réaliser les aspirations d’équité et d’excellence en éducation dans les cœurs, les mains et les esprits de tous les élèves. Students at schools participating in What did you do in school today? complete the Learning Bar’s Tell Them From Me 2.0 survey, which measures different aspects of social, institutional, and intellectual engagement; school and classroom climate; students’ self reported “achievement” in math, language arts and science classes; and a variety of demographic data relating to socio-economic status, ethnicity, gender etc. Willms, Friesen, and Milton, 16 – 29. R. Bolstad, (March 25, 2009) Disciplining and Drafting, or 21st Century Learning? Shifting to 21st Century Thinking (New Zealand Council for Education Research). Available at www.shiftingthinking.org/?p=546.